I read Horten's Miraculous Mechanisms : Magic, Mystery, & a Very Strange Adventure at the urging of Jennifer and Amy. I was told it was a middle grade adventure story that I would like if I liked The Mysterious Benedict Society, which I do. My father-in-law had given me some birthday spending money on Amazon (happy, yes?) and with it I purchased this Sure-to-Love-It! set. Ok, that's the background story. For starters, in Horten's Miraculous Mechanisms we meet Horten, who is ten-years-old but appears smaller for his age. Horten is an only child whose parents move him from the town he grew up in to Beeten, a small town in Great Britain, where this story is set. His mother is a doctor ("the sort who peers down a microscope") and his father is a creator of crossword puzzles ("who never used an ordinary, modern word if there was a medieval fourteen-letter alternative"). Horten is not what you would call 'close' to either of his parents and they seem largely unsure of what to do with their offspring. Beeton happens to be the town where several of Horten's ancestors lived, including his great uncle Teeny Tiny Tony Horten, who was a great magician. Great uncle Tony disappeared some number of years ago and never returned. No one knows where he went or where he hid all of his magical illusions and mechanical tricks. Hidden somewhere in Beeton is Tony's workshop, and young Horten seems "just the right sort of boy" to find it. Making friends with some neighborhood triplets, specifically the one by the name of April, Horten does indeed find the missing workshop through a series of puzzles and clues. My biggest pet-peeve about these books is the way that Lissa Evans designed the father figure. He is such a clueless character who seems to have no idea how to connect with Horten and lives entirely in his own little world of letters and big words. Given the fact that Horten's dad creates puzzles for a living, I kept waiting and hoping that he'd become involved in the adventures but, alas, he never does. (In the second book, he does participate in one of the magic challenges but he seems confused by the experience over all.) No one in the book seems to either like the dad or understand him because he lives in another realm. Horten spends a great deal of the books in frustration towards his father, because of his inability to communicate with the "common man." The only time Horten rises to his father's defense is when someone else is picking on him but on the whole I found all of these descriptions of people complaining about Horten's dad to Horten to be quite tacky. It was the most distasteful part of the book and as it is a running theme, I can't help but take note of it. This is strictly an adventure for Horten and his friends and his parents clearly just get in the way of things. Contrast and compare that to The Mysterious Benedict Society, where Mr. Benedict is kind, benevolent and involved, I have to like MBS more. But, like I said, I enjoyed both Horten's Miraculous Mechanisms and Horten's Incredible Illusions enough to read them myself and look forward to sharing them with my kids when they are old enough to join in on the fun. Overall, I'd say these books are good, adventurous FUN and I am very glad to have read them! My one and only issue with the books is the lazy father figure. Otherwise, they are great! But if you only took one of my reading suggestions, go for The Mysterious Benedict Society instead. These do sound interesting. "Medieval fourteen-letter words" indeed. The less-than-admirable-father thing grates on me too. It seems that men are the one class that it is still okay to mock. That said, the absent parent (or parents) is pretty much necessary for this type of adventure. Whether they are absent due to a war (Narina), dead (um, thousands of books), or wicked stepparents (ditto), they pretty much are expected to stay out of the way. (And if they don't, they are an interference.) I think that that is one of the attractions of fantasy books. A child (or an adult) can imagine being on their own, without parental support or restrictions. The hero(ine) must learn and follow the rules of the world as the author creates it, of course, but gets to be an adult within that world. @Tim, I agree with you. The parents do, by nature, have to be out of the way in some form or fashion for such adventures to take place. (Another reason I like MBS, as I stated in my review, is that the father figure knew he had to step aside, but he kept a watchful eye.) Which is infinitely preferred to having the father involved just to mock him further, as I'm sure you will agree. I'm not complaining that he was not a part of the adventure. I'm complaining that he was mocked upon conclusion. He was so IN the picture that he either needed to be included in a very fun, respectful and adventurous sort of way OR he needed to be happily sidelined. Somehow. I liked Tim's thoughts on the parents being out of the way...it's the mocking and the cluelessness that grates on one. Yay!!! I agree (as does 8-year-old Kyle) about the 2nd book being more enjoyable than the first. However, I thought the character dev was better in the first, which Kyle could care less about -- ha ha. I agree that absent parents are one of those magical things about fun MG fiction. But I love it when an author can show loving -- if clueless -- parents (oh wait -- I just read your other comment that it's okay for them to be left out). One thing that stood out to me was when the mom wrote the dad a note reminding him to be mindful, and she reminded Stanley to leave notes so that his father would remember where he was -- or something like that. It was like "he's odd and quirky, but he really does mean well." And hmmm, I don't know if I agree about MBS. The parents are pretty absent and clueless and unsupportive, though by the end it sort of wraps up differently. 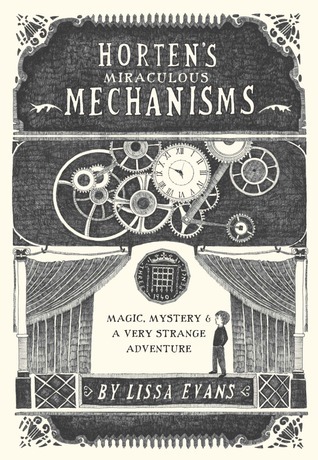 I can't comment about the parent issue since I haven't read the book, but based on all the great reviews I checked out Horten's Miraculous Mechanisms for my daughter (12) to read. She liked it okay, but she was very ho-hum about it. When it comes to The Mysterious Benedict Society she raves about those! I'm like you ... we tend to stray from fathers that are portrayed badly in books and TV. It is so disappointing to find that when in our house Daddy is our hero!